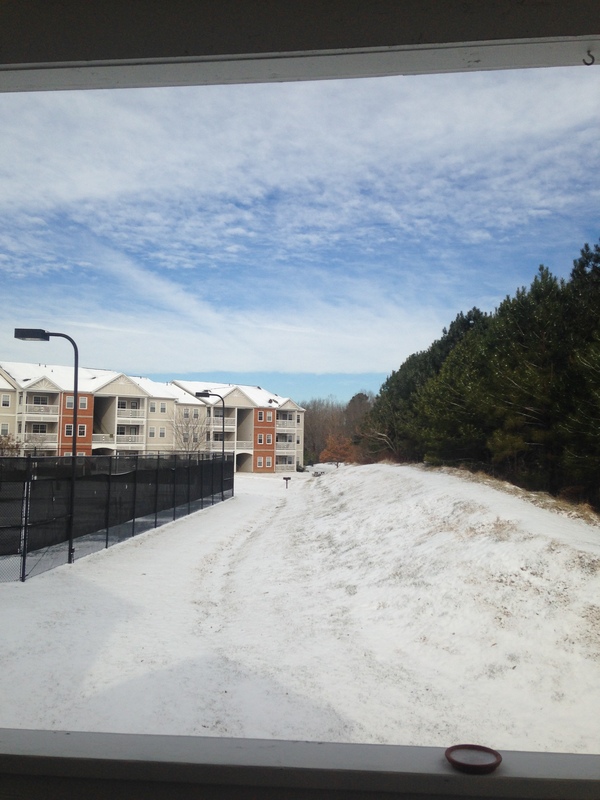 Snow day in NC!!!! Thanks Leon! 1. Secondary students have limited time. Once students hit middle school, they have classes that they are required to take. Often times, students spend a limited amount of time with each teacher, so teachers are not usually willing to let students miss a class period once/twice per week (not to mention time lost due to testing, assemblies, field trips and required remedial programs). How can you provide service delivery when students only have a limited amount of time in the day? a. Schedule students in sessions per quarter (rather than sessions once/twice per week). Unlike many of my peers, my schedule is a fluid, ever changing thing. So when a teacher says, “Johnny can’t come to see you today because he failed his science test and needs to retake it.” I can say, “OK, I will catch him twice next week” to make up for the lost session. FLEXIBILITY is key! Scheduling times per quarter is also helpful when state mandated testing rolls around. In my experience, this is a horrible time for students and speech language therapy is the last thing on their minds. If I can avoid it, I do not schedule therapy on days students are testing. Remember though – you should not schedule students based on your convenience! The team decides what level of support the student needs to access his/her IEP goals – which you can translate into times per quarter. c. CONSIDER OTHER MODELS OF SERVICE DELIVERY. I think the biggest problem that I see is the Related Service Support Description (e.g. support plan) is considered a means to exit students from speech and language supports, or provide less supports. THIS IS NOT TRUE!!!! Let me explain: Sally is a 6th grader with a significant learning disability. She is reading independently at a mid 3rd grade level and writing is below grade level. She works hard and is turning in most of her homework (which she completes in her resource class with the resource teacher). Her homework completion is saving her grade, because she is failing tests (as you would imagine since her skills are not at the 6th grade level). Classroom instruction is moving much too fast and the gap is growing. Enter specialized instruction team! Wouldn’t it make more sense for the EC teacher to be able to spend more time with the general education teacher to adapt assignments to ensure that they are on Sally’s level (IN ALL CLASSES), so Sally can benefit from the instruction and learn? It also stands to reason that the speech and language pathologist could provide input as well to address language needs in the classroom. This way, Sally is getting that support throughout the day (not just in speech and language therapy sessions). Unfortunately, there is limited or no time for this collaboration throughout the day. Everyone’s schedule (including the kids’) is so jam packed, that we are relying on our predetermined times set on the IEP instead of looking at the bigger picture here. It’s like putting band-aids on a broken bone. 2. Student Motivation – As students enter adolescence, they worry about “being cool,” yet strive to fit in with their peers. In my experience, pulling students out of class to work with me is the worst thing I could possibly do for their self esteem. No amount of prize boxes or bribery can make up for that. I see VERY few students 1:1 for this reason. Over the last 2.5 years, I’ve worked very hard to build positive relationships with my students and have done so with many of them. It has become clear that INCLUSION YIELDS THE BEST RESULTS. a. INCLUSION. So there are many levels of inclusion (more on this later), but I hate going into the classroom and acting as support staff for a teacher’s lesson. I do not want to go into the classroom and walk around keeping students on task and “getting them through” the assignment. For me the best place to do this inclusion is by “pushing in” to student’s small group resource classes. Over the last couple of years, I have slowly built relationships with resource teachers, and they allow me to come into their classrooms once or twice per week to delver a lesson to the whole class (usually 5-6 students). We give it a jazzy name like “Writer’s Workshop” (haha). I create lessons that are targeting the language based needs of a couple of students in the class; however, the entire group benefits from the instruction. This set up gives me the best chances at student participation and allows the resource teacher to see what I’m doing so he/she can carry that skill over into other lessons. For example, I have been working on teaching my 6th graders how to write a paragraph using a 4 square graphic organizer. Now, when the student is asked to write a paragraph in Language Arts, the resource teacher in that collaborative class can refer back to the graphic organizer that students used in Writer’s Workshop (disclaimer: we call it Writer’s Workshop, but reading comprehension or other language based objectives can easily be addressed). A good resource for this is Western Michigan’s (Go Broncos!) Writing Lab Outreach Project – found here. All of this makes me wonder, what if we changed the traditional views of speech therapy? What if I primarily served as a consultant for teachers (both EC and gen ed) to address language based needs in the classroom? Would I still lead Writer’s Workshops and drive instruction through student data? – ABSOLUTELY! How are others serving their students? I have THE BEST news: I have been accepted to intern at CAMP CHATTERBOX this summer!!!!! During the last ASHA conference, I had the incredible fortune to sit next to Joan Bruno – founder of this amazing camp (not to mention several other AAC tools, like the TASP) . We chatted on our way to our next session, and I was hooked. I came back from Chicago, and immediately applied to intern this summer. I’ve been officially accepted and I CAN’T WAIT!!!! This is an AMAZING opportunity! If you know someone who would benefit (AAC user, family member, or therapist) – I highly encourage you to share this information. Come join us at Camp Chatterbox. I know it will be a great time! Here is a form I came up with to help personalize AAC communication systems in my district. I really wanted a way to get parent input as to the best ways to customize devices to fit their needs. My hope is that this will help families “buy in” to the idea that AAC is meant to be with the child at all times and serve as that person’s voice. I based this form off of the PODD system, but these questions could easily apply to any device. I refer to the AAC user as “student” because I’m in a school. The more collaboration you have (including the AAC user to whatever extent possible) in choosing vocabulary, the better. There are a couple of questions that I wouldn’t typically include – for example asking whether or not a parent would want undergarments or religion included on their device – but because I work in a school, I want to make sure that I’m not making parents uncomfortable or crossing any legal boundaries. That being said, my true belief is that we should never omit words because they are uncomfortable (we can’t unteach that swear word to a toddler). Best practice says to keep them in. Lately, I’ve been thinking a lot about AAC evaluation. What makes a good AAC eval? How can you sift through all of the apps and devices out there to feature match the best device for each individual client? There’s so much to consider and there’s no one size fits all tool. *This app has 14 subtests that measure different skills like: visual identification skills, visual discrimination skills, vocabulary, category recognition and other skills. At the end of each session you get a nice summary that you can print out and add to your assessment report. While I think AAC assessment is largely a qualitative process, it’s nice to have some “numbers” to support the recommendations I am making. 2. Janice Light’s Framework of Communicative Competence for individuals using AAC (Light, 1989). 1. Functionality of Communication = Is the system functional for the individual? This will change based on the context. Yesterday, I was working with a student during a craft activity. He needed more glue, so I modeled asking for glue using his communication notebook. He followed my model and I handed him a crayon (my ultimate goal was to expose him to “different”). He happily began to color on his paper. Palm to forehead – I did not make this communication opportunity functional for him (or very motivating for that matter). He didn’t care about the glue or the crayon. Functionality of communication is ever-changing – make sure to look at the different environments and communication partners in addition to the person you are evaluating. 2. Adequacy of Communication = This means the student can adequately communicate what he/she needs in any given environment, at any given time. Adequacy does NOT mean mastery. Does anybody really have mastery over language? 3. Sufficiency of Knowledge, Judgement, & Skill in using the device = This component has four subcomponents to evaluate. b. Operational competence = can the individual operate the device? Some devices are pretty comprehensive and tech heavy. My AAC professor explained that we all have a set amount of cognitive resources. If you are devoting a lot of resources to just working the device, then you have less resources to devote towards using existing language skills to generate a message. For example, I cannot figure out how to type in this blog and carry on a conversation at the same time – just not happening. c. Social Competence = There are two prongs to this one. I, for one, definitely need to look more into this, but it’s obvious that confidence is key. d. Strategic Competence = If you’ve ever been to a country that you do not speak the language, you know this feeling. You don’t know how to say what you need to say, so you mime, give single words, and just do whatever you can to get the point across. It’s important that individuals using AAC are able to make the best of what they can do. Whew… One last point – these skills CANNOT happen in isolation. A student may be able to whiz through a device, but if they are not functionally communicating with it – they are NOT a competent communicator. I’m curious to hear what others are using for AAC assessment. Please share! Light, J. (1989). Toward a Definition of Communicative Competence for individuals using augmentative and alternative communication systems. Augmentative and Alternative Communication, 137-144. Light, J. (1988). Interaction involving individuals using augmentative and alternative communication systems: State of the art and future directions for research. Augmentative and Alternative Communication, 4, 66-82.